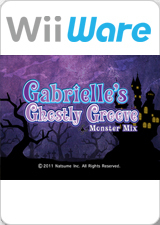 In Gabrielle's Ghostly Groove: Monster Mix, get ready to groove to the beat! Join Gabrielle and her monster friends as they dance along to a spooktacular selection of songs. Grab your Wii Remote controller and dance along as you shimmy, shake, and spin in time to the music! There's trouble in Monster Town! Vlad the vampire's loyal zombies have disappeared. Gabrielle and all her monster friends will have to bust some serious moves on the dance floor in order to lure them back. Along the way, maybe they can uncover the identity of the mysterious creature that's terrorizing Monster Town's zombies! The graph below charts the compatibility with Gabrielle's Ghostly Groove: Monster Mix since Dolphin's 2.0 release, listing revisions only where a compatibility change occurred. This page was last edited on 15 January 2018, at 02:21.